For over half a century, policymakers committed to population control have perpetrated a gigantic, costly, and inhumane fraud upon the human race. They have robbed people of the developing countries of their progeny and the people of the developed world of their pocketbooks. 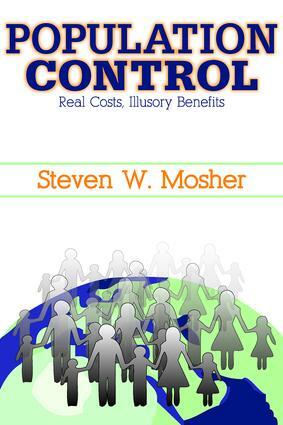 Determined to stop population growth at all costs, those Mosher calls "population controllers" have abused women, targeted racial and religious minorities, undermined primary health care programs, and encouraged dictatorial actions if not dictatorship. They have skewed the foreign aid programs of the United States and other developed countries in an anti-natal direction, corrupted dozens of well-intentioned nongovernmental organizations, and impoverished authentic development programs. Blinded by zealotry, they have even embraced the most brutal birth control campaign in history: China's infamous one-child policy, with all its attendant horrors. There is no workable demographic definition of "overpopulation." Those who argue for its premises conjure up images of poverty - low incomes, poor health, unemployment, malnutrition, overcrowded housing to justify anti-natal programs. The irony is that such policies have in many ways caused what they predicted - a world which is poorer materially, less diverse culturally, less advanced economically, and plagued by disease. The population controllers have not only studiously ignored mounting evidence of their multiple failures; they have avoided the biggest story of them all. Fertility rates are in free fall around the globe. Movements with billions of dollars at their disposal, not to mention thousands of paid advocates, do not go quietly to their graves. Moreover, many in the movement are not content to merely achieve zero population growth, they want to see negative population numbers. In their view, our current population should be reduced to one or two billion or so. Such a goal would keep these interest groups fully employed. It would also have dangerous consequences for a global environment.